Deputy Jenkins and Grand County Sheriff Jesse Tyler were murdered 20 miles north of Thompson Springs. Tyler, 36, and Jenkins, 46, were part of a posse searching the Book Cliffs for a notorious rustler. Upon encountering a group of men camped near Hill Creek, the two officers approached unaware that the man they were seeking was among them. When the men in the camp recognized the sheriff, they opened fire. Both officers died instantly. Although pursued for several weeks by a posse, the killers were able to escape. The reported leader of this group, a notorious member of the Wild Bunch, was killed by Colorado lawmen in 1904 following a train robbery. Deputy Jenkins is buried in Ogden City Cemetery. His bronze memorial plaque is sponsored by the Riverdale Police Association. 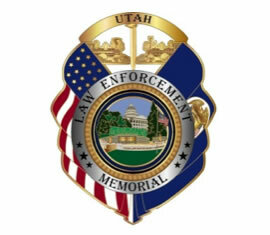 I am so proud to be a member of the Utah Peace Officer Association which started the Utah Law Enforcement Memorial. Both are proud members of Utah’s Law Enforcement Community. The UPOA recognizes, each year, 14 (different) fallen officers. If anyone has contact information on relatives I am the keeper of fallen officer relative information. When events come up that honor our fallen officers we reach out to family/relative members when these events occur. I can be reached at blsmith@sandy.Utah.gov.